Deep red satin blooms on this tightly mounded Threadleaf. Tightly mounded habit with dark, fine-threadleaf foliage. Summer blooms are a deep red satin shade that is attractive to the sight and touch. Attracts butterflies. 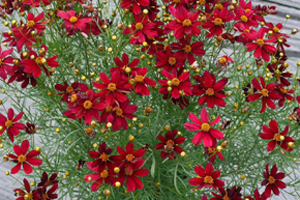 Great in a cutting garden, butterfly garden, as a ground cover or in a container. Copyright © 2014 GET Group Inc.